"Google Chrome is a browser that combines a minimal design with sophisticated technology to make the web faster, safer, and easier" - says Google. - Web search. Web history. Address bar. Suggestions as you type. One unified box serves all your browsing needs. - Every time you open a new tab, you'll see a visual sampling of your most visited sites, most used search engines, and recently bookmarked pages and closed tabs. Detachable and re-attachable tabs. Each tab is a new process (may be, crashes will be restricted to one tab only). - Use web apps without opening your browser. Application shortcuts can directly load your favorite online apps. 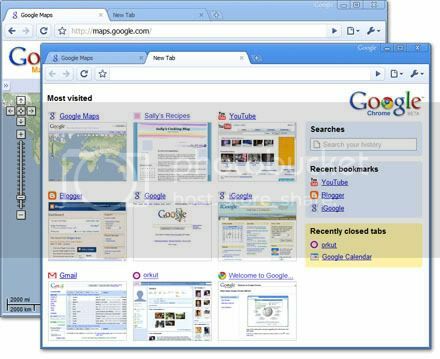 - You can drag tabs out of the browser to create new windows, gather multiple tabs into one window or arrange your tabs however you wish -- quickly and easily. - Every tab you're using is run independently in the browser, so if one app crashes it won't take anything else down. - No intrusive download manager; you see your download's status at the bottom of your current window. Also, it is having problems when using https. May be will be fixed soon.